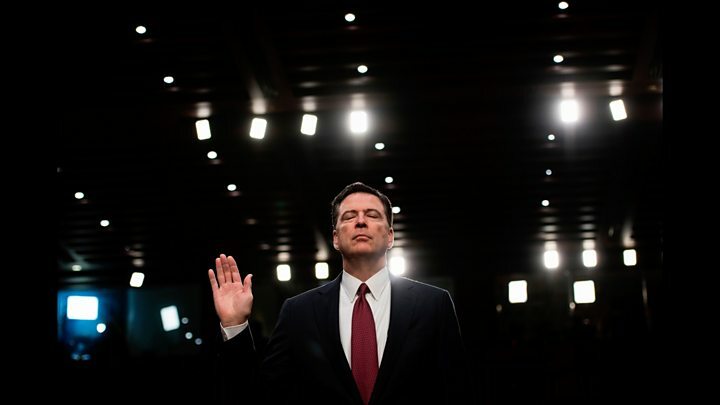 Comey may be many things, but is he really a liar? So let's cut straight to it. I've been reading the book, and watched the interview. I also spent hours listening to James Comey giving testimony to Congress before he was fired and afterwards. And my views about him have coalesced. I think he is vain, arrogant, pious, slightly pompous, supercilious, faux-naïve over the Hillary Clinton emails and the role he played in determining the outcome of the election, and sly in the personal comments he makes about Donald Trump - orange face, white half-moon eyes and (not unusually small) hands. A little juvenile, no? And most of all I think it is the lowest of political smears to give credence to the Moscow hotel peeing prostitutes story on the basis of salacious and unsubstantiated claims. "I honestly never thought these words would come out of my mouth, but I don't know whether the current president of the United States was with prostitutes peeing on each other in Moscow in 2013," Comey said in an interview with ABC News. Well if you don't know, then don't say it. If the long serving prosecutor (as he was in his younger days) had said that in court, the defence would have risen and said "Objection your honour, conjecture". And the judge would have sustained that objection. So why is Comey doing that in a "nudge, nudge, wink, wink" way in his interview with George Stephanopoulos? It makes him look like a small, bitter man who lost his mind and lost his judgement at roughly the same time. There were a couple of other asides about the Trump's marriage that seemed to me to fit into the "unworthy" category. But there is one other judgement I would make about Comey. I don't think he's a liar. And on the stuff that really matters, that is the key. If it ever comes to an impeachment process against President Trump (something interestingly Comey says he hopes doesn't happen - his argument that it was the American people who elected him; it should therefore be the American people who boot him from office), then his testimony could prove vital. In the interview, he asserts there is "certainly some evidence" that Donald Trump obstructed justice in asking the former FBI chief to see a way of dropping the case against Michael Flynn, the former national security advisor (Flynn has since pleaded guilty to one charge of lying to the FBI). Comey thought it so unusual that he was having one-to-one meetings with the president, without the attorney general or chief of staff present, that he took a contemporaneous (ugly word, I know) note of the meeting - either in the form of an aide-mémoire to himself, or in a memorandum to colleagues. Why this matters is that in a court case, an FBI officer's contemporaneous note is admissible as evidence. Just like a recording of the conversation. Are we to believe that the serving head of the FBI deliberately fabricated these notes because he knew sooner rather than later he was going to be fired, and these could then be used to help bring an obstruction of justice case against the sitting president? Comey is an ambitious, proud and status-conscious kind of guy. He wanted to do everything to keep his job - self immolation was never part of his plan. In the interview he talks about flying back from the West Coast immediately after he'd been unceremoniously fired. You could see the memory of that still caused him pain. But proving he is a liar is a key element to Republican strategy at the moment. That is the way you draw his sting. The rest is just playground insults. The argument from the White House is that Comey is "known to be a leaker and a liar" - a phrase used by the president; a phrase used by his press secretary, Sarah Sanders. The evidence, as they see it, is his changing explanation for re-opening the Hillary Clinton email investigation. And giving testimony initially to Congress that the president had not sought to interfere over the treatment of Flynn. They also accuse Comey of leaking classified emails. The president tweeted that he will go down in history as the worst ever director of the FBI. Well, let's see. He will certainly go down as one of the most controversial - yes, even running J Edgar Hoover close. His behaviour over the Hillary Clinton emails is unbelievable - for both Republicans and Democrats alike - although for different reasons. And they show the worst of Comey. He announces she's not going to be prosecuted for her use of a private email server when she was Secretary of State, but then added a stern rebuke to her behaviour, saying she'd been extremely careless. FBI directors normally don't say anything. That was grandstanding. Then two weeks before polling day - two weeks! - he announced he was reopening the investigation because of the discovery of a new hoard of emails. It totally transformed the closing stages of the campaign, and led to a massive reverse in the polls. But he made that announcement before looking at what those emails were. And then just days before polling, he exonerated candidate Clinton. So what the hell was that all about? I thought what he said was hogwash and the reasoning flawed. But I don't doubt his sincerity when he says he felt he had no other course of action open to him. In the interview Comey gets nowhere near to giving an adequate explanation of why he did what he did. He looks like he was trying to be too clever by half. He told Congress a few months back that it left him feeling mildly nauseous to think that he could have affected the outcome of the 2016 presidential election. Only mildly? He is deeply flawed. But ultimately it will come down to a question of who do you believe: the president or his former FBI director? 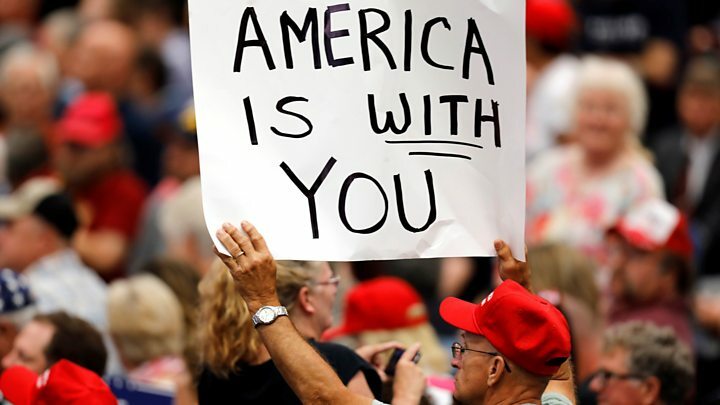 One has a bit of a track record of, how can one put this, making assertions that don't bear close scrutiny (for example, the false claims that Obama wasn't born in the US, therefore was illegitimate as president, that Muslims in New Jersey cheered when the twin towers came down in 2001, that the crowds for his inauguration were bigger than Obama's, that three million people voted illegally and that his was the biggest electoral college victory since Reagan - I could go on). His former communications director, Hope Hicks told a congressional hearing that one of her jobs was to tell "white lies" for the president. Media captionDo Trump voters care about the Russia investigation? 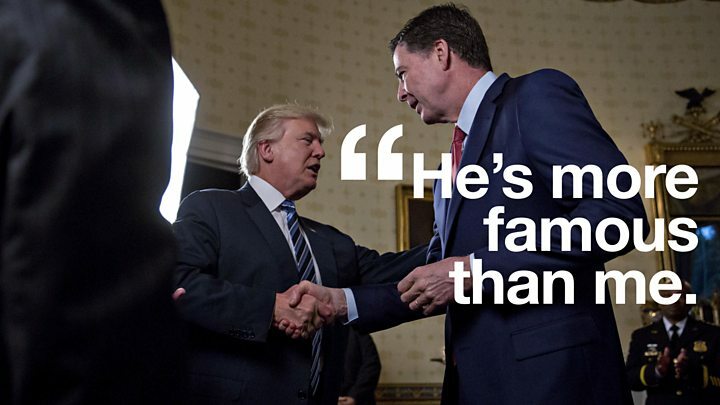 The president has called Comey a slimeball. Quite possibly. But to neutralise him fully, Donald Trump has to undermine his credibility, and prove he's a liar. That hasn't happened yet, so for the moment the 6ft 8in former FBI director can still walk tall. And that makes him dangerous.